Fiji National University (FNU) acting vice-chancellor Professor Ian Rouse called on members of the public, especially young Fijians to look after their teeth well. He was the chief guest at Colgate’s 2015 National Toothbrushing Day which was celebrated around the country yesterday. Speaking at the launch at the FNU Nasinu Campus, Professor Rouse commended the event because it helped in building a healthy Fiji. “Students you should take care of your teeth because they will take care of you,” Prof Rouse said. 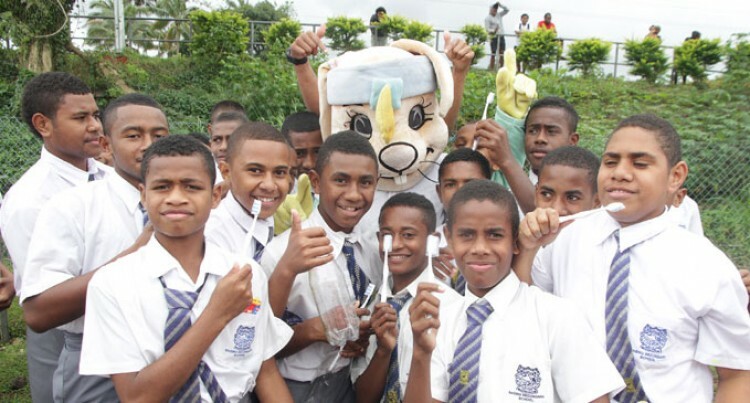 National Toothbrushing Day is organised by Colgate-Palmolive (Fiji) Limited, in partnership with the Ministry of Health. It is to help encourage people to brush their teeth daily. Colgate Palmolive general manager Nick Ryan said this year 199,980 people participated in the event compared to 190,000 last year. “This programme is one of the many oral health programmes which leverage off Colgate’s Global Oral Health Education Programme, Bright Smiles, Bright Futures,” Mr Ryan said. Ministry of Health national advisor oral health, Joan Lal said the Ministry, since the start of the annual event in 2009, had been trying to rope in many people to participate. “For the first time this year we have included high school students also and we are thinking of implementing tooth-brushing programmes in the high school curriculum,” Mrs Lal said.